After his accident, Kevin Carta needed something more than a typical office job to motivate him. Cue Frozen Coconut – an organic, lactose-free dessert that gave Carta a new lease on life. Kevin Carta abandoned a blossoming career in ballet. His garage-band music label folded before it ever really took off. And, if the single-car accident that left him a T10 complete paraplegic at age 20 wasn’t enough, less than a decade later he found himself in another collision—this one involving a second car and his own family of passengers, leaving him with severe post-traumatic stress. By his 30th birthday, it seemed as though life had handed Kevin Carta a whole lot of lemons. Fortunately, life also granted Carta a zest for entrepreneurial adventure along with a like-minded friend, Ryan Geni, who had recently been laid off. On account of his pregnant wife’s lactose intolerance and his own vegan preferences, Geni had learned to make a mean homemade coconut ice cream. 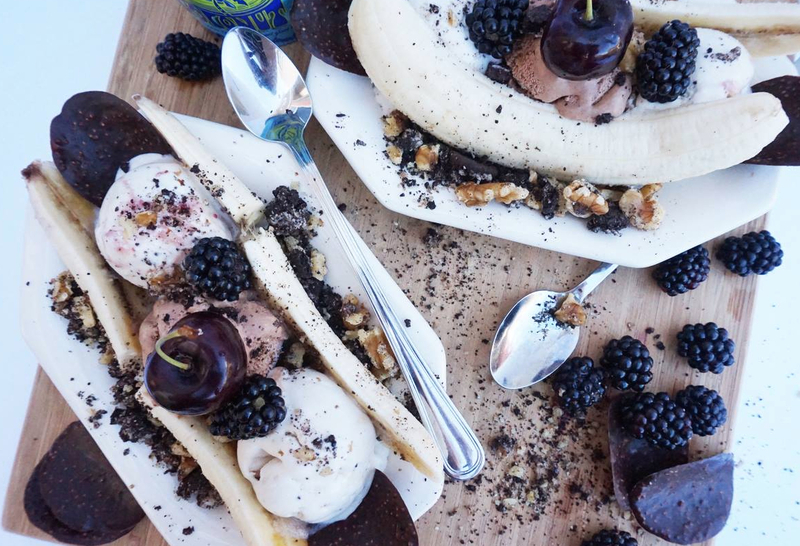 When Carta hosted a small birthday soiree at his Kelowna house, Geni brought over a bucket of the creamy, dairy-free dessert. It was a hit, and Frozen Coconut was born. The duo began selling the organic, lactose-free coconut concoction at the Kelowna Farmer’s Market, first in single-serve cups, then in plain one-litre tubs. But after two successful summers, and with coconut still on trend as a “superfood” and customers asking about home delivery options during the farmer’s market’s off-season, the pair realized they’d reached a tipping point—they needed to go big, or go home. They got their product into a few supermarkets—but they realized that before they could knock on doors in earnest, they’d need some real credentials. And Geni had a plan. But Geni was serious. Located in New Jersey, Malcolm Stogo’s Ice Cream University gives its students the opportunity to study with frozen dessert enthusiasts from around the world in a classroom-kitchen setting. Geni and Carta signed on, and over five intensive days, they honed techniques in non-dairy ice cream production and strengthened their existing product under the guidance of the university’s namesake president and professor—a repeat author, inventor of the chocolate-dipped waffle cone, and a veritable celebrity in the world of frozen delights. Despite a few setbacks near the end—the duo just narrowly avoided getting stranded by Hurricane Sandy—the trip was a delicious scholarly success. Armed with new confidence and knowledge, Carta and Geni arrived home and quickly transitioned their lovely bunch of coconut ice creams into a budding business. Frozen Coconut Desserts are organic, and lactose and dairy free. Retailers embraced their creation. Today, the tropical tubs of melt-in-your-mouth goodness are sold in over 100 stores across Western Canada, including Urban Fare, Cooper’s Foods, Save-On-Foods, and Dad’s Organic Market. Carta, now 33, recently moved from Kelowna to Vancouver to be near his vendor base and the company’s Richmond manufacturing facility, which is where we caught up with him. The well-lit, simply-stocked and modestly-sized room is a far cry from the kind of manufacturing plant you associate with modern-day food labels. 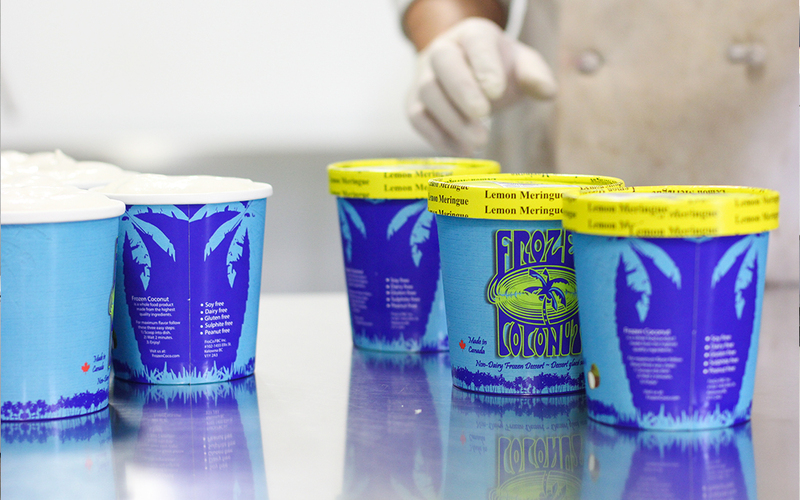 And, like its facility, Frozen Coconut’s production process is refreshingly minimalist. Raw, fair trade coconut milk, sourced from Thailand, allows for a taste and texture that’s creamy, not oily. The balanced sweetness comes from agave syrup, and a touch of sea salt rounds out the flavours. Frozen Coconut contains no dyes or additives. And because it’s organic, lactose-free and nut-free, it’s truly a product that everyone can enjoy—a completely inclusive dessert, if you will. That same inclusiveness extends to the brand’s business model: always say yes; add value, not competition. However, Frozen Coconut draws the line when it comes to trade secrets—recently, the company’s new brand manager not-so-gently advised Carta to keep details of six new tropical flavours, set to launch in the Spring of 2015, a corporate secret. These days, Carta is experiencing sweet success, but it’s never far from his mind that life before Frozen Coconut was a rocky road. True, his post-injury stays at both the Vancouver General Hospital and GF Strong Rehabilitation Centre had been fortuitously brief (in high school, Carta had broken both of his legs snowboarding and was somewhat accustomed to maneuvering a wheelchair). but a couple of years after his injury, Carta fell into a pattern of depression, anxiety, and isolation. It took several more years for him to get back to a place of confidence and focus. And just when he did, he was thrown into a second car collision. For two years, he stayed in his house with a girlfriend who was happy to do the same. And then, a pact from the past caught up to him. Nearly a decade earlier, Carta and a friend from rehab had made a deal that, when they were ready and medicine had advanced enough, they would travel abroad for experimental surgery. Now Carta’s friend was eager to go (though it was questionable whether or not medicine had truly advanced). Alone, he would never have elected the surgery or a trip to India, but Carta isn’t a man who backs out of a deal. So he and his friend travelled to New Delhi. And although the success of the epidural surgery was limited, the trip itself helped Carta address his anxiety and withdrawal. With the weight of his curse lifted, Carta returned to Canada and narrowed his focus: from small business to health food to coconut ice cream. And the rest is history. Carta and an employee at the Frozen Coconut prodution plant on Mitchell Island, south of Vancouver. Currently, Frozen Coconut has a handful of competitors in North America. 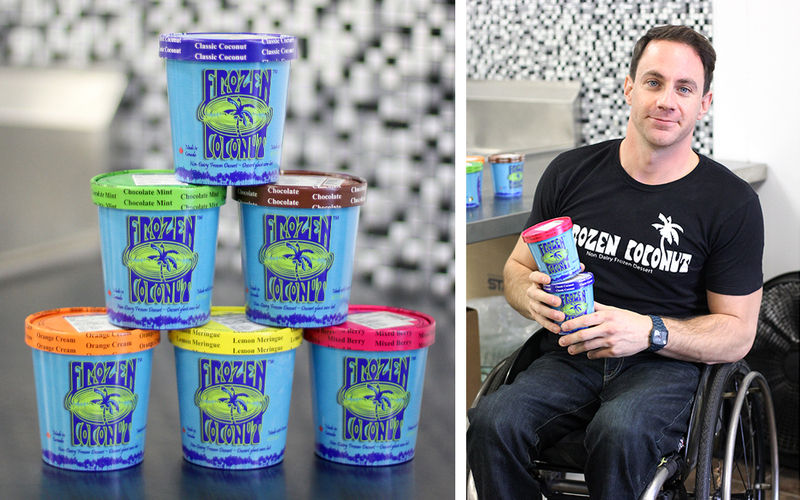 But with sales tripling between this past April and June, more than 100 stores already carrying the product in Canada, and a lofty but realistic goal of adding another 500 vendors by next summer, Frozen Coconut’s momentum won’t be thawing any time soon. It’s been said that when life gives you lemons, make lemonade. It’s only fitting then that one of Frozen Coconut’s most popular flavours is Lemon Meringue. To locate Frozen Coconut vendors, get more info, or connect with Kevin, visit frozencoco.ca. 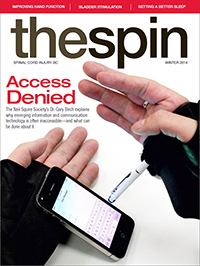 Read the entire Winter 2014 issue online!